This print commemorates a performance of the play Igagoe Norikake Gappa at the Kado Theater in the 9th month of 1827. Illustrated in Ikeda Bunko, Kamigata yakusha-e shūsei, vol. 2, Osaka, 1998, No 47. 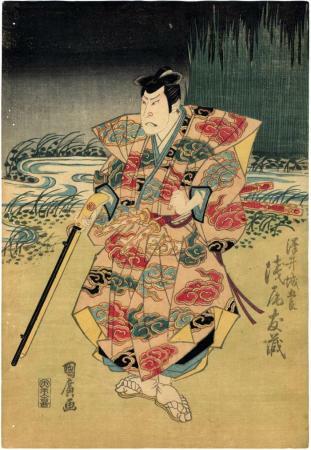 "Igagoe norikake gappa (A raincoat and riding through Iga Pass: 伊賀越乗掛合羽) appears to be an adaptation of a real life vendetta in 1634 at Iga Ueno when Watanabe Kazuma slayed Kawai Matagorô, the murderer of his father, Watanabe Yukie, killed four years earlier. Kazuma was aided by his brother-in-law, the master swordsman Araki Mataemon. Dramatizations of Watanabe's vendetta took various forms, categorized as Igagoe mono (Igagoe plays: 伊賀越物). The Iga katakiuchi mono (plays about revenge killings: 敵討物) consititute one of the three most frequently performed stories, the others being Chûshingura mono (plays about the treasury of loyal retainers, or "Forty-seven rônin": 忠臣藏物) and Soga mono (plays about the Soga brothers: 曾我物). The first known kabuki staging of an Igagoe mono took place in 1725 (Iga Ueno katakiuchi) in Osaka. Bunraku staged its first performance in 1776. Igagoe norikake gappa (1777) written by Nagawa Kamesuke, was staged for bunraku in 1778, and presented for kabuki in Edo (1784) and Osaka (1793). The standard version, a ten-act drama scripted by Chikamatsu Hanj with Chikamatsu Kasaku in 1783 for the Takemoto puppet theater, Osaka, is Igagoe dôchû sugoroku (Crossing at Iga along a sugoroku journey: 伊賀越道中双六). In English, the story was retold by Algernon B. Mitford (Lord Redesdale, 1837-1916) in Tales of Old Japan, where it is called Kazuma's Revenge."